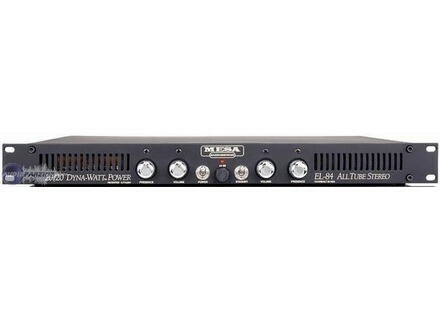 2:20 Dynawatt, Guitar Power Amplifier from Mesa Boogie. A friend has bought the new 20/20; he wanted to buy my VHT 2/50/2 but was too powerful and has craqu seeing 20/20 in store. Config tests: JMP1 + 20/20 + Mesa Mesa Rectifier 2x12 cabinet V30 guitar ESP EC1000 Dimarzio pickups ToneZone (bridge) and Airzone (sleeve), Orville By Gibson Custom Les PAul (microphones Gibson Classic 57). To be played on JMP1 VHT 2/50/2 and for two years I t surprised Performance Mesa 20/20. Cot volume, no doubt, spit fort, no fear before a drummer, even nerv. The sound is dynamic and color at least more with my VHT. The problem is that the sound is very medium, quite aggressive. Even with the presence of 0, a frisouille ears ... Something I did not report with the VHT. Going up the volume, the potato is still shy but serious, voire..insuffisants (the fault of the EL84?). This is a point to take into considration, according to the jou style. Do not possdant of rglage of "resonnance" or "depth" (yes ... the full VHT was him ...) difficult to overcome this default. When I was playing on my neck pickup Les Paul OBG, serious GNRs not VHT was almost too powerful, making the shadow bassist. The definition is less accuracy of all as we turn up the volume, was still very okay despite everything, but compare (always) my VHT, it almost seems to have more distortion ... But a dirty distortion, less dfinie that more reasonable volume. Far from being ridiculous, 20/20 is none the less for the performance it offers. I lower my opinion compared to the poweramp I know best, the VHT 2/50/2 which presents many more possibilities of rglages (voicing, Depth, Presence, Class A / B or Class A) 20/20 and yet costing the same price; more with the pad of attnuation on each channel of VHT, go down the power equivalent of a 2x25watts. Try it, I did not t conquered by the sound, but one thing is sre, the sound will fall more color with this Mesa with a VHT. We hear a 50/50 and that of the same brand is much prcis his little brother, I have not tried. The choice for this Poweramp will be more a matter of taste than budget, there are more "faithful" and better dfini for the same price. output to a 2x12 cab (with 2 Celestion V30) stereo. but the Preamp Mesa "Studio" (Stereo) there is also a lot. Bought a year ago for my home studio - I record DI output from the "Record" of MB Studio. Compared to other amps ... this is a must! In addition to the single stereo 20/20 that I know of). Strato1963's review (This content has been automatically translated from French)"The only one in its class! A Must!" Stereo amplifier system for guitar, lamps 2x20 watts. Each side is equipped with a 1/2 12AX7 pre-amp signal, a 12AX7 as a driver for a pair of EL84 Push-Pull rise sauce Mesa-Boogie. The connection is simple, by hand, we find an entrance, a slave output allows the recovery of pre-amplified signal to external treatment (super direct box lamp), 1 output 8 Ohms, 4 Ohms output 2. The front panel always by hand, a volume control and a presence control (sort of light booster - the compressor effect against acute-reactive). For the management of power, we have a switch and the classic "Stand By" necessary to preheat the lamp filaments. 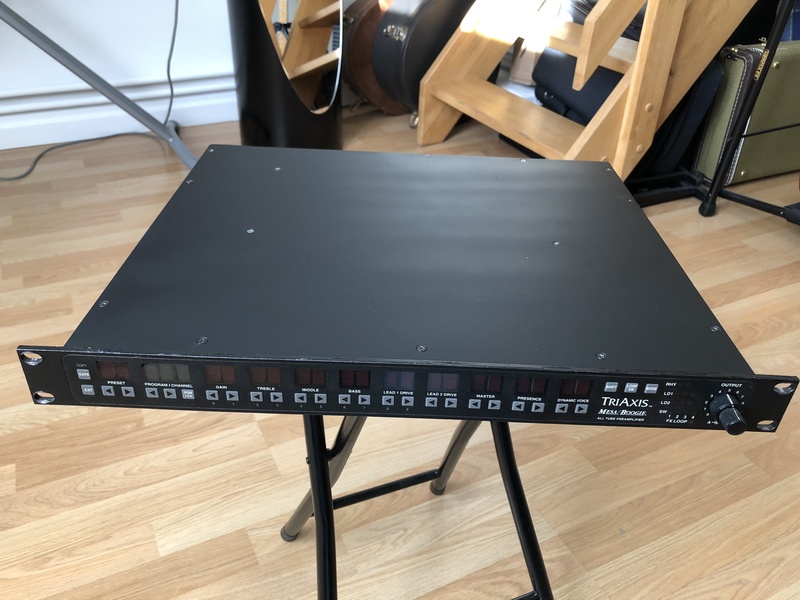 This unit is 11 kg in the form 1U rackmount, the black finish is the most beautiful effect (there was a series Aluminium finish, but very few copies were imported). The construction is a rock solid, nothing that the front impresses by its thickness. You will notice that its depth is about 32 centimeters (excluding pots), which can be a problem when it is placed in a rack. Side configuration, there is nothing easier! it connects the preamp outputs to the inputs of the amplifier (called AB and not left-right), two loudspeakers are connected to the outputs suitable compatible (4, 8 Ohms), switching power 1 minute later and the Stand By . The sound is powerful, muscular and extremely dynamic. We immediately recognize the leg majestic Randall Smith, Master ES Mesa-Boogie, Boogie all designer since the late &#39;60s. I readily admit not being objective, few manufacturers have been able to approach the perfection of a tonal Boogie. Connected to speakers of questionable quality, this amp havoc, the sounds are thick, overdriven sounds remarkably accurate. An interesting test for the most reluctant would connect a guitar directly to the input of the monster. It was the "Sound" instantly. 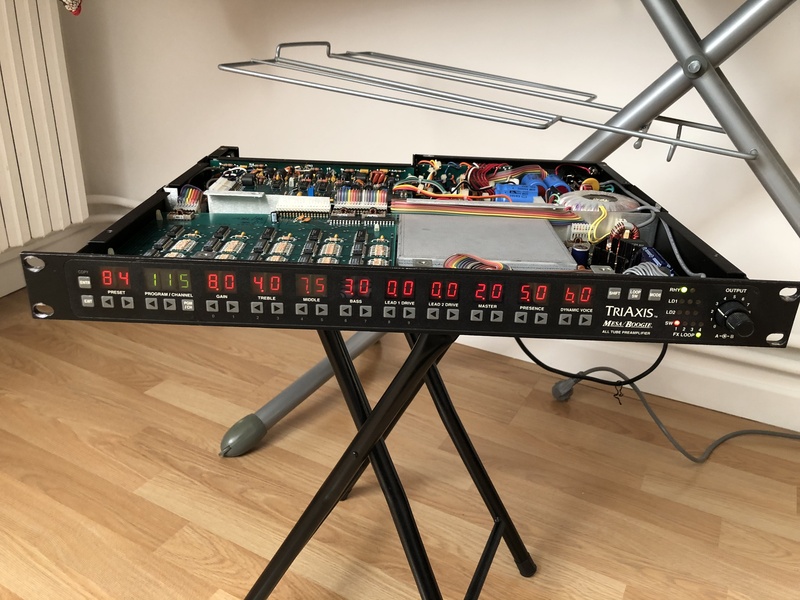 The manual is available in English (on the manufacturer&#39;s website), but the illustrations are numerous and can be coupled quickly and efficiently, all modules of the rack. Spare parts are perfectly nomenclaturées will make it easy to contact the manufacturer on its website. Personally, I&#39;ve owned many Boogie without any reliability issues. This amplifier is capable of adapting to all styles of music without limitations no. To my knowledge, there is no equivalent on the market as effective. Also, when making this choice, it must be done in the long term because the amount to pay is not negligible. 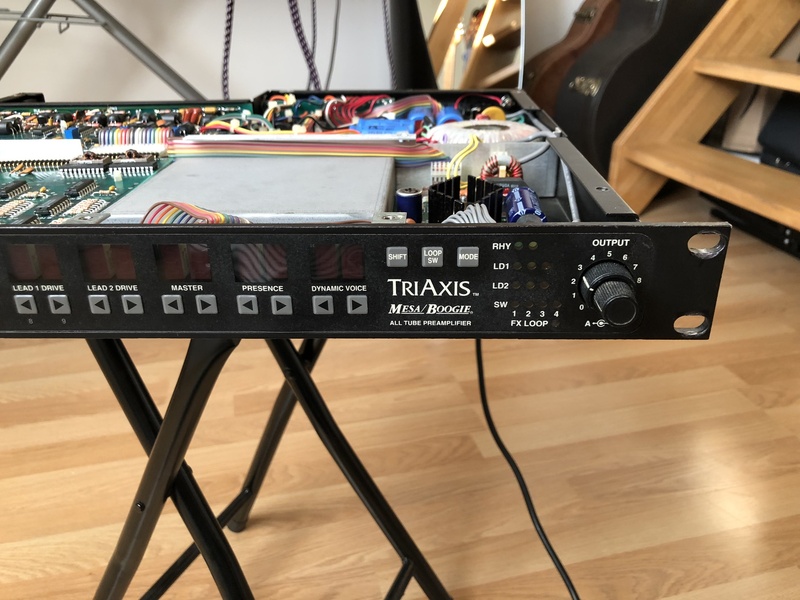 Responding to the precept "The quality and efficiency of the system is less than or equal to the worst part of the product," I made a rack around this amp, preamp with the Triaxis brand, a G- strength and TC Electronic M2000, all connections are wired MOGAMI. In fact, I do not use the reverberations of G-Force, not that they are bad, quite the contrary, but to counteract the latency induced by programs too loaded machine resources when switching the MIDI . This may seem high, but this is the price to pay for a universal sounds as diverse and varied as the situations require. I spent hundreds (thousands) of Euros additional equipment purchases other brands thinking to save money, but by dint of buying and selling without stopping, I lost irretrievably money. I really like this amp, everything is serious, lamp bases are ceramic is hand built (open the top cover of the Two-Twenty to realize the beauty of the wiring) is reliable and, above all, the sound is right there. 2:20 I use this since September 2002, he took over a Boogie Simul-Class 395, too strong and heavy for the size of the training rooms and with-in which I played. Before that, I joined the Marshall 2x100 watts, then the smallest 2x50 watts, and finally the even smaller 2x20 watts. I&#39;ve never been satisfied! Even today, I am surprised at the tremendous power that this "small amp" can generate. 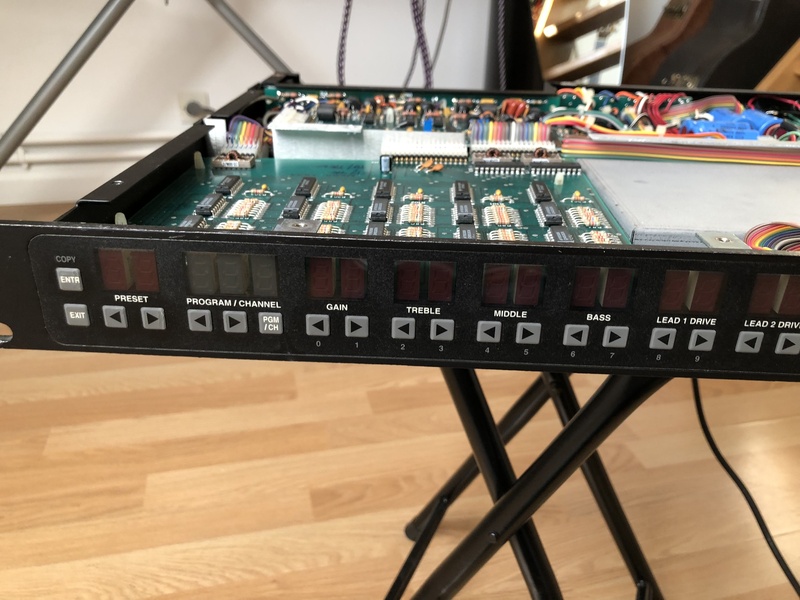 If it is connected, like mine, with baffles "Thiele" brand (equipped with Electro-Voice EVM 12L, now abandoned), the result can be deafening. Anyway be careful of potentiometers volume, your ears may not recover. I see only the positive side, this amp will restore your system with loyalty, its relatively small electric power is not a disability, the proof is the resurgence of very low power amps, many on the market. odnalro's review (This content has been automatically translated from French)" Bomb 20 20"
4 months playing in various situations'm delighted when providing my v twin preamp that I use loose! I connect LE FX live on 20/20/et nikel depuisj'ai turned the v twin and I play live. I aurrais before the purchase!